click here to listen to music from the film "Flipper"
Follow this link to motherjones.com and see why you must complete our Coral Survey and unite with us to save our world's coral reefs before it is too late. Time is running out - WE MUST ACT NOW -OR IT WILL BE TOO LATE TO SAVE OUR REEFS FROM DESTRUCTION! Please complete our Survey at the bottom of the page and send your replies to us by email. Find out more information about our coral reefs worldwide by clicking on this link. During the turtle nesting season make sure lights don't disturb nesting turtles or disorient hatchlings and prevent them from reaching the sea. REMEMBER MARINE TURTLES ARE PROTECTED BY CAYMAN LAW! It is illegal to take, disturb or molest turtles between May and October. This offence carries a fine of up to $500,000 or 12 months' imprisonment. Possession of wild turtle eggs at any time is also an offence and carries the same penalty. Contact the Department of Environment on 949-8469 for more information of alternative 'turtle-friendly' lighting so that we can protect our turtles during the next breeding season. 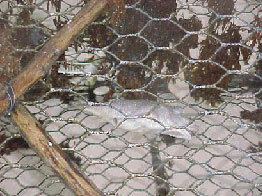 Fish pots/traps are used to catch fish from the world's coral reefs. This one was brought to the shore from a reef by north westerly/easterly winds in North Side, Grand Cayman, in an unrestricted marine area. There is overfishing taking place all over the world and this is causing species of marine life to become extinct. You will have read in the last two pages that in the Cayman Islands we have a Marine Conservation Board to help prevent this from happening in Cayman waters. We have restricted the use of fish pots/traps to prevent depletion of fish and destruction of coral reefs. 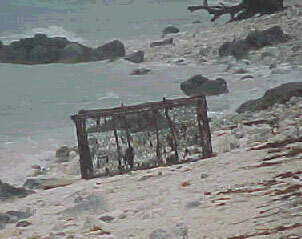 In Bermuda, fish pots/traps were found to be damaging reef structure. In 1990 it was decided to close the $2 million pot fishing industry. The World Resources Institute says that by protecting their coral reefs in this way, Bermuda recognised the importance of its reef-based tourism and recreational industries (valued at over $9 million in 1988). By closing the pot fishing industry they were also benefitting reef biodiversity. Kenya's reefs were being threatened by overfishing, destructive fishing practices, organic pollution, sedimentation and tourist damage. To protect these reefs from destruction it was decided to form the Mombasa Marine National Park in 1989. The World Resources Institute says that surveys have shown a major increase in finfish size, abundance and diversity, and recorded coral cover has increased from 8 per cent to 30 per cent. The World Resources Institute (WRI) says that these reports show that there are solutions that can help assure that reefs at risk today are maintained as healthy ecosystems in the future. They say that what is needed is resources and commitment from governments around the world. There are threats to the world's coral reef ecosystems from overfishing, pollution and coastal development. Please give your views/comments by email on the following questions, so that we can unite and save these ecosystems from destruction. Coral reefs are as important as rainforests to mankind. They need to be protected now before it is too late for them and us! 1 Do you think that we should have Marine Conservation areas to protect the world's coral reefs? 2 Do you think that research into ways of saving these ecosystems is important? 3 Can you think of ways to help save the world's coral reefs from destruction? 4 Will you unite with us to try and save the world's coral ecosystems? 5 Do you think it is a good idea to have a Coral Site similar to the sites you will visit when you follow the link below? We MUST protect our marine life from extinction!